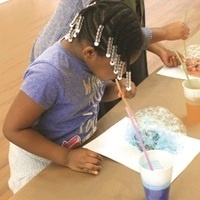 The University Galleries Museum Education Program offers two FREE Family Art Days where children and families can participate in fun and interactive tours of exhibitions to experience art towards participants creating their very own works of art as part of the event. The goal for these activities is to engage audiences in the ideas and techniques of art making by inspiring visitors to create works of art together as families, connecting their creative art making to artworks viewed and discussed in the Galleries. Families and children will discover diverse approaches to creating through the multi-media works of selected contemporary Southeastern artists’ art currently on display in both the Ritter and Schmidt galleries.